Now a day I am very much irregular in my blogging because I'm quite busy. Actually, we are planning to buy a flat in Pune. So, almost every day we are going out in search for flats. Naturally, after a hectic day, I am getting very tired, so unable to write blogs. Anyways I tried to find some time to write on the new topic. Today I’m reviewing one of my favorite face pack, which works very well on my skin these days i.e. 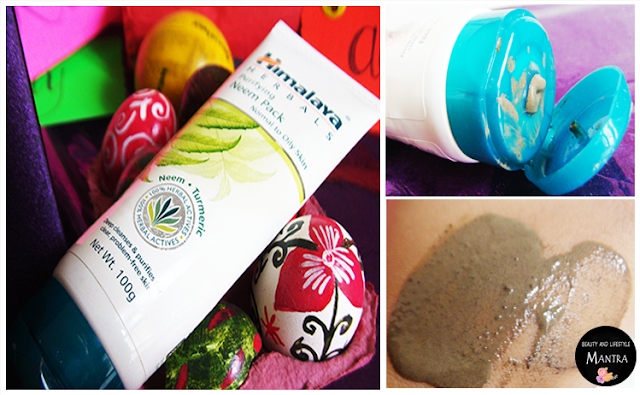 Himalaya Herbals Neem Face Pack. Purifying Neem Pack is that which helps to regulate excess oil secretion, cleans clogged pores and prevents the recurrence of pimples. Presence of excellent skin care ingredients helps to improve the overall skin. Fuller’s Earth: Fuller's Earth is primarily used to lighten the skin. It has cooling and anti-inflammatory properties that remove deep-seated dirt and skin pollutants. Neem: It has antibacterial properties, helps in controlling acne and pimples, and their recurrence. Turmeric: Turmeric has been used as an antiseptic for centuries. The herb also has strong anti-inflammatory properties which soothe your skin gently. It also makes your skin soft and supple. Apply over cleansed face and neck, avoiding the area around eyes. Let the mask dry for 10-15 minutes and remove with a wet sponge or towel and wash with cool water. For better results use once and twice a week. 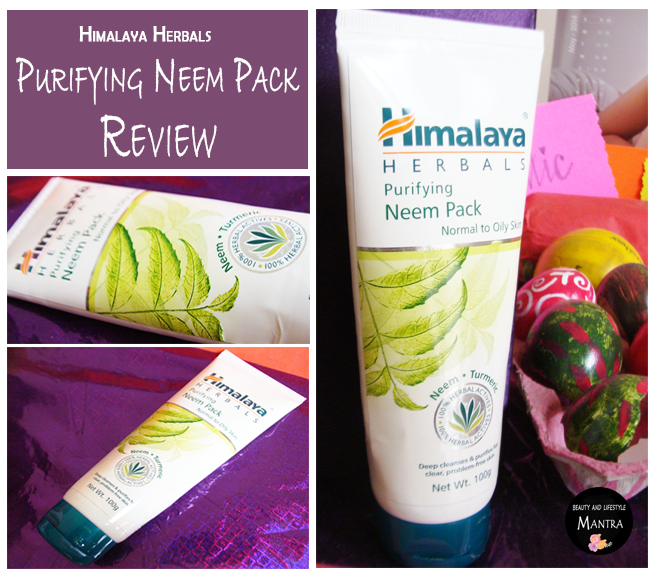 Here I would like to mention that I used this Purifying Neem Pack for last one year before this review. It comes in a typical Himalaya Herbals white tube packaging with a green flip top cap. The flip cap of this product is sturdy enough. The packaging is easy to use and travel friendly. The pack is a mud pack with a runny paste base and a muddy texture. It spreads easily with fingers. It contains small exfoliating particles and oil. It is Muddy dark green in color. It is natural and not irritating. I loved the natural neem fragrance of this face pack. Over the past two years, I have an acne problem. I always keep cleaning my face as well as I've been using various types of the pack (most are of home-made) to get rid of acne. I've used this neem face pack regularly for my acne treatment. Purifying Neem Pack is one of my favorite face packs. Usually, I left the face pack on for about 20 minutes or so. When it starts to dry out and gets a little tight, I remove the face pack using an old face towel. So while removing the product on my face, I massage my face gently using the towel and by doing that I feel like my face is super clean and very fresh. Moreover, the pack contains small exfoliating particles which help to scrub the skin. I use it twice a week at night. The best part of this face pack is that it actually works on acne or pimples. If you have a pimple you can do one thing regularly, apply this pack only on the pimple, the swelling will be reduced within two days. Himalaya Neem Face Pack contains natural ingredients like neem and turmeric which work together to regulate excess oil secretion, clean clogged pores and prevent the recurrence of pimples. These natural ingredients help to prevent infection and give a natural glow, tone, and firm the skin. Leaves skin feeling clean, fresh and deeply exfoliated. Spreads very smoothly over the face. Great for oily and acne pore skin. Comes in a hygienic, travel-friendly packaging. The quantity of the mask is very good. Its price is very much affordable. I noticed that it turns slightly runny in hot weather so store in a cool place. Does tingle a bit for the few minutes. Yes, I highly recommend this product for those who have oily and acne pore skin. It tingles a bit, so sensitive skin beauties think once before using. Overall, the face pack is nice and you will love to use it. It will make your face glow and even tighten your skin. Really it clean and deeply exfoliated without leaving skin extra dry. It is great for acne pore skin. *** This post is not sponsored. All products are bought with my own money and reviewed at my own discretion.